While connecting in Seattle last month on my way back to Bangkok, I did some shopping in the airport stores. Seattle-Tacoma International has a surprisingly good collection of shops for a US airport. While there, I decided to load up on specialties of the Pacific Northwest: cherries, smoked salmon, and gray salt caramels. Seattle seems to be turning into a mecca for quality handcrafted chocolates. My friend was the part owner of a shop there and I’ve read countless articles about other artisanal chocolate makers in the region. 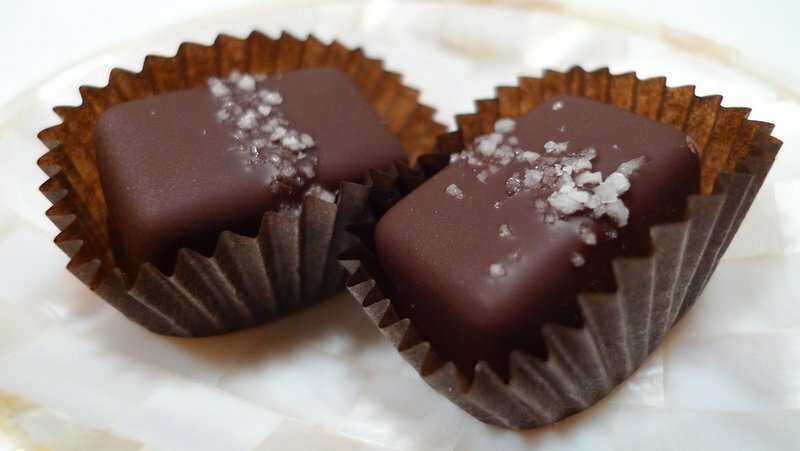 Sadly, my friend’s chocolate shop is now out of business, but that didn’t stop me from picking up two boxes of these gray salt caramels in dark chocolate, made by Fran’s Chocolates. Salt caramels were the “it” confection in 2010, I think. Little delicate crystals of salt that contrast both in flavor and texture with the rich chewiness caramel inside. It is a lovely combination. I wonder what new combination will greet us this year? This entry was posted in Uncategorized and tagged Candy, Caramel, Chocolate, dessert, food, salt by christao408. Bookmark the permalink. I don’t believe I have ever had these chocolates. I should try sometime. Seattle has good chocolates and good coffee??? I really need to go there. Never heard of these!! I will have to pick up some on my next trip down south! @Wangium – Actually, you may be right Jason. Bacon was a big thing in 2010, maybe I’m a bit behind on this salted caramel thing. What’s your prediction for the food trend of 2011? @lil_squirrel4ever – No doubt there are some up Vancouver way, too. @TheCheshireGrins – Twice the reasons to go, Meg. Actually, you would love Seattle, I’m sure. @ZSA_MD – Oh, you simply must try them. @marc11864 – Trying to provide you with what you need, even if it is what you can’t have, Marc. @Fatcat723 – Oh, thank you for making the sacrifice and trying them all, Rob! =D@yang1815 – I thought the picture turned out pretty nice for a point and shoot. I haven’t been to Seattle in a long time. It’s a nice place. i’ve never had a salted caramel chocolate, but i have had salted caramel ice cream… quite delicious. i think the last few popular trends have been about mixing unusual flavor combinations, particularly sweet and salty — salted caramel, bacon and chocolate… i wouldn’t be surprised to see something else along this line of thought. @yang1815 – you poor thing, who is gonna look after you? @yang1815 – Oh, tell her to stop by Pike’s Place market! @ElusiveWords – Nobody will look after him, that’s the problem! =D@kunhuo42 – Sardines and…? @murisopsis – Perhaps I should just ship some to you? @ElusiveWords – Rosey and her five friends. @christao408 – Ay ay sir!Apparently she’s staying a few blocks away from it. That’s the great thing about food, there is always chef’s coming up with new and exciting flavours!